Note: You can create shapes only in imported or newly created .pptx files, not in .odp or .ppt files. In a presentation, click a slide that you want to insert shapes into. Click the Add a Shape icon in the toolbar. 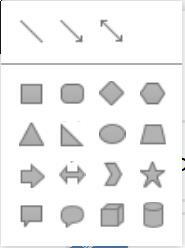 Click the shape that you want to insert from the shapes layout and drag it to the size you like. 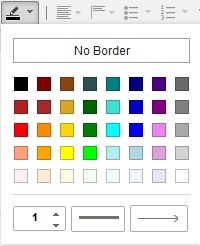 Optional: Change the border color, background color or line weight of the shape. The color and line weight can be exported correctly. 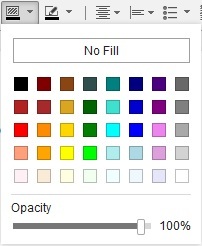 Click the Set Fill Color icon in the toolbar and select a color. The shape color is changed. Click the Set Line Style icon in the toolbar and select a color, set line weight, and specify line patterns. For lines and arrows, you can also set line endpoints.